The German media have been particularly excitable this week. They kicked off with floating the idea that there was momentum in the polls (“SPD up by almost two points!”) and concluded with covering the infamous magazine cover portraying Peer Steinbrück flaunting his finger. Moreover, the idea that the eurosceptic AfD might enter parliament has gained some traction. Of course, there is zero new evidence, but some days ago a leading pollster said that he could not rule out a result north of five per cent (the threshold). Given that they have been polling between three and four per cent and considering the margin of error, that is a very sensible statement. By this morning, it had morphed into “Pollsters Expect that AfD will force Grand Coalition”. My totally scientifically objective hybrid human-computer qualitative analysis of the press (i.e. me browsing the internet) shows that the more pro-business papers are pushing that story – presumably because the AfD’s leader, a professor of macro economics, has the ear of a few editors. The party does have, however, an unusually strong social media presence. If that is indicative of anything is anyone’s guess. The most recent iteration includes three new polls from week 36 (the week after the debate) as well as two from this week, and they are as noisy as ever. Ratings for the CDU are particularly variable (between 39 and 44 per cent), which is to be expected since the sampling error is bigger for parties that are close to 50 per cent. But according to model, this is mostly noise, and the party is still solidly somewhere in the area of 40 per cent (or slightly more). 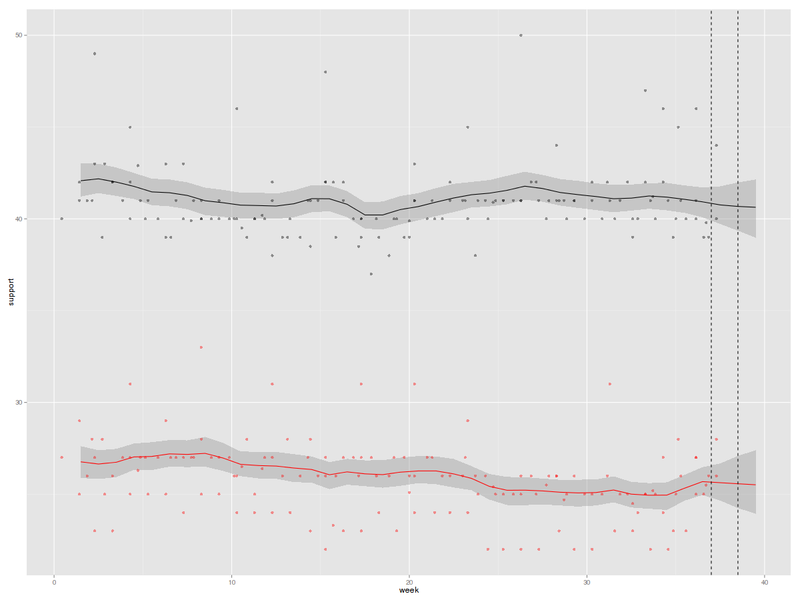 The SPD’s support has indeed risen a bit over the last couple of weeks (all polls before finger-gate). But in the great scheme of things, that does not seem to matter much: The party is still stuck well under 30 per cent. Looking on the bright side, they will probably do better than the abysmal 23 per cent they got in 2009. The decline of the Greens seems to be levelling out. Their recent drop in popularity not withstanding, the model predicts that the party will come third at about ten percent. 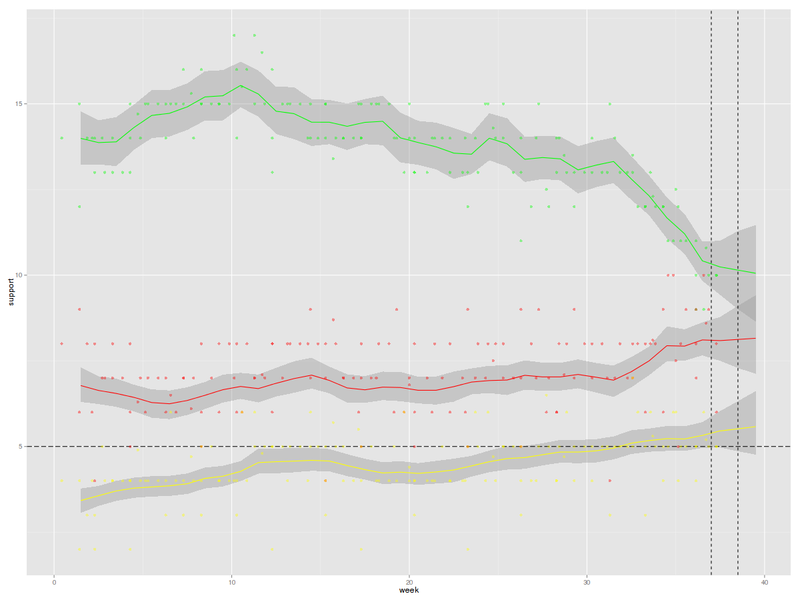 Support for the Left is basically constant and stable, while the FDP continues to inch upward. According to the model, Merkel’s preferred coalition partner will almost certainly make it into parliament. The estimated probability of a new mandate for the current coalition is now 89 per cent. If tactical voting is taken into account, that number goes up to 94 per cent. The probability of a red-green majority is constant at virtually zero per cent. The SPD has repeatedly ruled out that they would accept any arrangement involving the Left. In line with previous posts, I assume that there is a 10 per cent chance that they nonetheless consider the unspeakable. Plugging this into the calculation, the probability of Merkel winning a third term is estimated at 98.9/99.4 per cent (with/without tactical voting for the FDP). Over the next six days, the CDU’s main problem will be the complacency of their voters: With the race virtually run, they might simply be too lazy to turn out to vote. The SPD, on the other hand, seems to be making very small noises that imply that they might be interested in entering another Not-So-Grand Coalition. And the FDP will make a desperate appeal to their supporters (whom?) while trying to convince at least some CDU voters that yellow-blue is the new black. Much will depend on the outcome of today’s state election in Bavaria: While Bavaria is basically representative for, well, Bavaria, politicians, journalists and voters will inevitably take it as a bellwether for the big one. Let’s wait and see then, shall we? Wg tego modelu http://t.co/MV2isYXemi prawdopodobieństwo reelekcji CDU/CSU-FDP wynosi 89%, a koalicji SPD-Zieloni 0%.